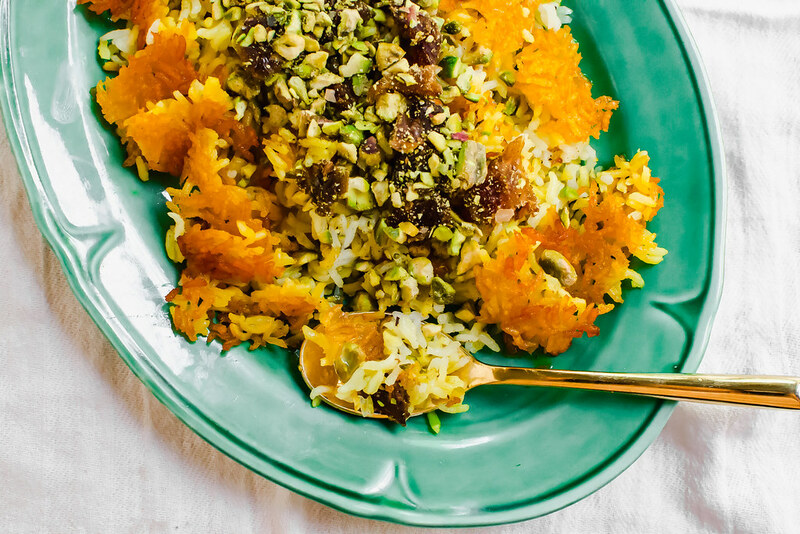 Persian rice with dates , chopped pistachios and aromatic cardamom is steamed together with an additive and crunchy saffron crust called tahdig. I noticed as I’m getting older, I am appreciating the simpler things. The simpler flavors and allowing really good ingredients to be themselves. Rice is a perfect example of that. A humble grain that can be transformed into a number of dishes, such as the classic sticky rice in a Hawaiian plate lunch or jeweled up in my Persian jeweled rice and my forever obsession, classic tahdig. The captivating crispy rice layer that many fight over. And yes, it’s worth it. Literally translating to “bottom of the pot” is the crispy rice layer that is formed with the twice-cooking method. And it’s not always a rice layer, I have made tahdig with thinly sliced potatoes such as in my recipe for adas polow (rice with lentils). Or you can mix the rice with yogurt and butter for a different texture. Either way, you want to create a crispy rice layer on the bottom, that you can either invert onto a platter or serve along side the rice. Persian Rice Dishes come in a number of ways. I’m still learning, but there are dozens of ways to present Persian rice. 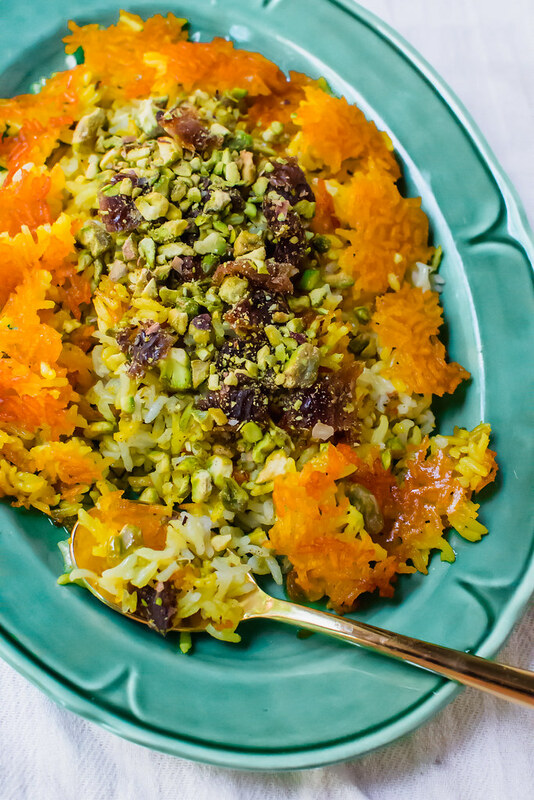 My recent favorite is rice with dates, pistachios and warm cardamom. The sweet dates pair beautifully with the crunchy pistachios and the cardamom offers just enough aroma to make you think ‘hmm..what is that?’, without being too overpowering. However, get creative! I have seen Persian rice dishes with stewed chicken layered in between (on the bucket list), or cooked with deep red cherries that creates a gorgeous pink hue. You can also add pomegranate seeds and, or golden raisins for a sweet finish. The possibilities are endless, so have fun with the flavors and colors. In other news, I’m hosting my own radio show! Kinda sorta, and yes! 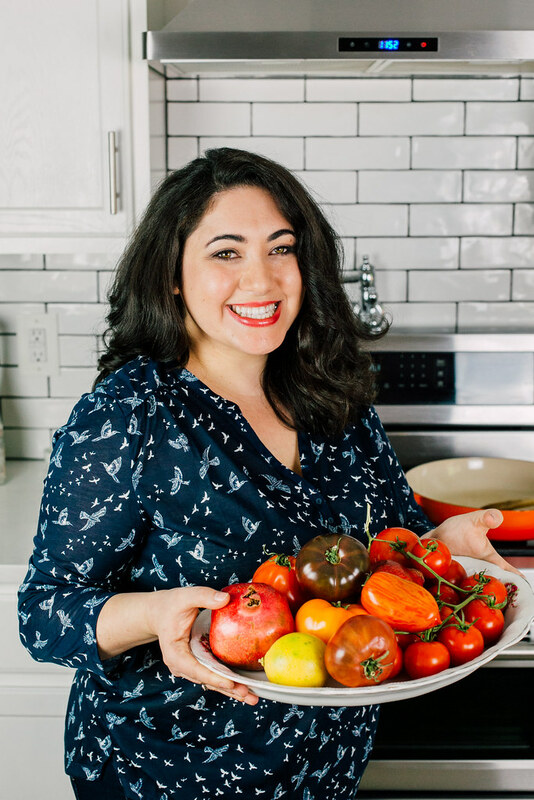 I’m teaming up with a local web cast radio based here in Bellingham, where I’ll be chatting about recipes, local farms and vendors and what’s cooking in my kitchen. My first topic is well..this rice with dates recipes! You can click HERE on KPNW’s website to see the list of episodes or click on the play button below! 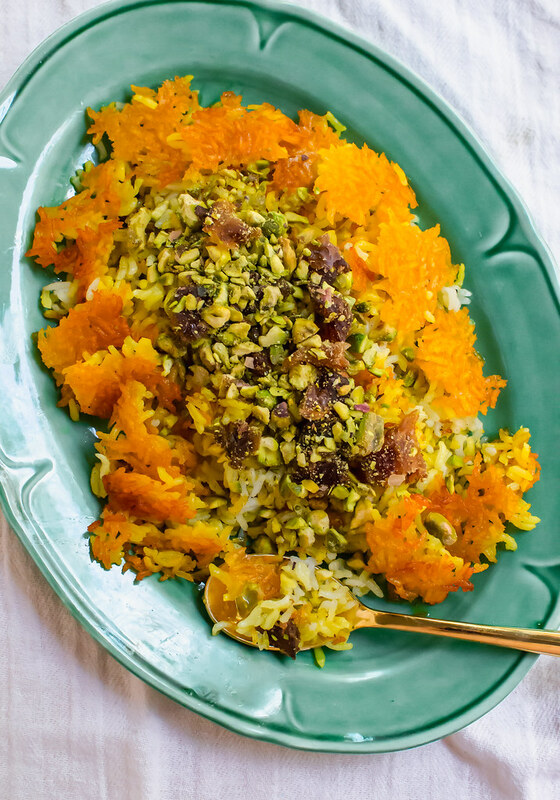 Persian rice with dates, chopped pistachios and aromatic cardamom is steamed together with an additive and crunchy saffron crust called tahdig. Begin by rinsking rice with cold water several times until the water runs clear. if you have the time, soak for an hour to overnight. While rice is soaking, stir together the chopped dates, pistachios and cardamom and set aside. Bring a large pot of water to a boil and add rice. Cook for about 6-7 minutes then test to see how done rice is. It should be par-cooked with the middle still being hard. Once done, drain rice in a colander and wipe the pot dry. Bring pot up to medium-high heat and drizzle with enough olive oil to coat the bottom. Stir in saffron water and turmeric. Slow add the rice back into the pot, making sure the bottom rice layer is evenly layered on the bottom. Then add in half the rice, being gentle and not pressing it in, but creating a mound. Scatter the date pistachio mixture on top of the rice and then finish with the rest of the rice, creating a mound. Use a chopstick to press in several holes into the rice. This will help the steam escape easily. Then wrap a clean kitchen towel over the lid and place the lid onto the pot. Cook the rice for about 10-12 minutes on medium-high heat until the rest of the rice is fully cooked and fluffy. Once done, you can either invert the entire pot onto a platter so the crispy tahdig is on top, or you can spoon the rice onto a platter and serve the crispy rice along side. What a delicious side dish! Loving the flavors going on! This is perfect when you need a dish with amazing flavor that just pop! So good! Love the addition of the chopped dates – that sweet compliment to this dish! Love it so much ! Pinned ! How do I make saffron water- or where do I buy it? Hi Nancy! You can mix a few tablespoons of water with a pinch of crushed saffron and let it steep for a few minutes.